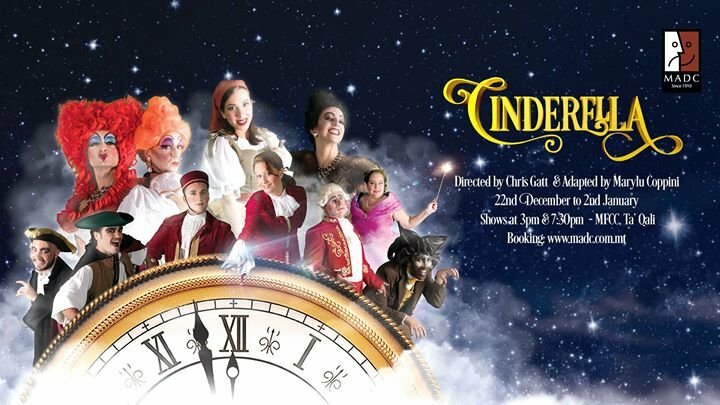 Join us for a couple of hours of festive fun and double trouble as MADC presents the ultimate pantomime CINDERELLA directed by Chris Gatt at the MFCC, Ta'Qali. Penned by Malta’s most popular comic actor Marylu Coppini, this year’s pantomime has not one but TWO dames: Jean-pierre Busuttil and Michael Mangion. Isabel Warrington is the stepmother Baroness Kifuza lording over super hen-pecked Baron Flooseless Renato Dimech and his lovely daughter Cinderella played by Rachael Tedesco Triccas. Sandie von Brockdorff is the thigh slapping Prince and Francesca Briffa will wave her magic wand as the Fairy Godmother making sure that every transformation of working clothes to ballroom gown and pumpkin to carriage works like a treat… or perhaps not! With Maestro Paul Abela once more waving his musical baton, Roger Tirazona will polish up the chorus to terpsichorean perfection and choreographer Francesco Nicodeme will make sure that everything looks better by leaps and bounds . Set designer Aldo Moretti along with Claudio and Jason Apap will transform the MFCC into an amazing toy theatre and Audrick Plum is in charge of flying Cinderella to the moon and back. And this year we’ve added more matinees to make sure all the family get the chance to enjoy the merry mayhem and magic. So make sure you have yourself a magical Christmas and book your seats today for CINDERELLA - THE WORLD’S FAVOURITE PANTOMIME! Shows start on Friday 22nd December at 7:30pm and run with a matinee, at 3pm and evening show at 7:30pm EVERY DAY from Saturday 23rd to Tuesday 2nd January. No performances on 24, 25, 31st Dec and 1st Jan.
Tickets start from only Euro10! Tickets also available at a REDUCED RATE FOR CHILDREN aged between 3 and 12. To make this pantomime even more magical, we have a SPECIAL OFFER on ALL tickets for Friday 22nd December at 7:30pm and Saturday 23rd at 3pm! A helpline is available from 9am to 9pm on 77776232.